ITV’s flagship and multi award-winning daytime show This Morning will launch an extraordinary You Can Be Heroes Week from Monday 7th January with the help of His Royal Highness The Prince of Wales. Determined to sustain the positive atmosphere and pride that was felt throughout the UK following the hugely successful 2012 Olympic and Paralympic Games, The Prince admits it will be a challenge, but together with This Morning, hopes that the Great British public can maintain and build on the incredible goodwill and enthusiasm that was generated by the Games-makers and its vital volunteers. "These sorts of occasions like the Olympics and the Jubilee bring out the best in people and I do know, from doing investitures on behalf of The Queen, just how many wonderful people there are doing these remarkable things and volunteering the whole time in their own communities. A lot of people don’t realize how so many of these people keep the whole show on the road. There is something remarkable in this country I think, about the volunteering spirit." "What I wanted to do with Youth United was to get all the uniformed services and others together to talk to them about how we could expand the opportunities. For many young people to do this (join youth uniformed services) I then discovered there is something like an 80,000 waiting list to get into the Scouts and Guides and most people have no idea about this. So there are a massive number of young people out there who want to, but can’t. Part of the reason is that they can’t find enough adult volunteers. Hopefully with the Olympics and all the interest we have more people who would like to get involved." Viewers will also have a chance to see behind the scenes footage of The Prince and the Duchess of Cornwall from last year’s Diamond Champions initiative, which celebrated the role of older volunteers who give their time to improve the lives of those around them. The hugely successful campaign was organised by the Women’s Royal Voluntary Service and in total 4,573 people were nominated as Diamond champions, representing 249 charities. Their Royal Highnesses who were Patrons of the initiative can be seen meeting the finalists at a reception at St James’s Palace. "I’ve gone on for years about the importance of thinking about the long term in relation to the environmental damage, climate change and everything else. We don’t, in a sensible world, want to hand on an increasingly dysfunctional world to our grandchildren, to leave them with the real problem. I don’t want to be confronted by my future grandchild and them say ‘why didn’t you do something’, so clearly now that we will have a grandchild, it makes it even more obvious to try and make sure we leave them something that isn’t a total poisoned chalice." "I constantly meet the families of those who have lost their sons, husbands, brothers or sisters and I have some understanding at least of what they go through." 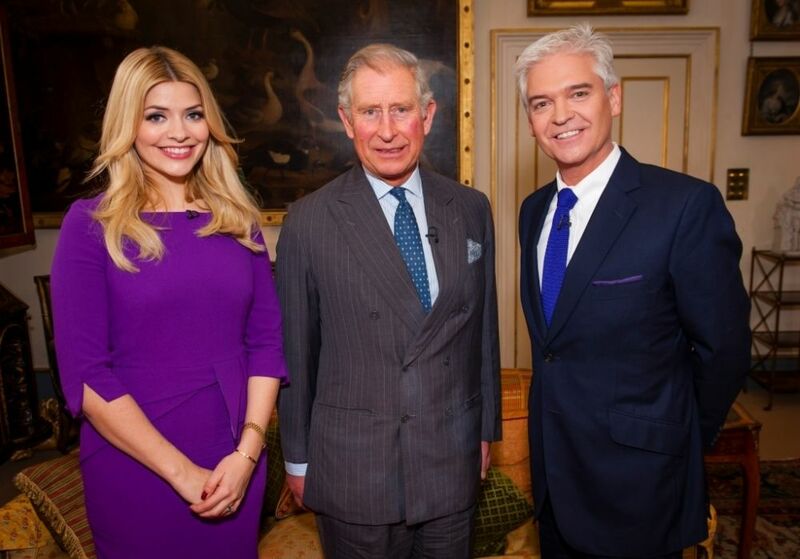 Viewers will get to see the full interview with The Prince of Wales on Monday 7th January. During This Morning’s You Can Be Heroes Week viewers will also witness what goes on within some of The Prince’s Charities and other such organisations, see the work the volunteers carry out and also learn how they can volunteer in their local area too. "Last year the whole country came together to cheer on our Team GB Olympic and Paralympic Heroes. But, a hero of another kind emerged - those who gave up their time to volunteer. They really helped to make every event such a success and it just goes to show how giving up a little bit of your time can really help." "I have previously carried out some volunteer work so I’ve witnessed firsthand how giving just a small amount of your time and effort really does make a huge difference to others in need." "We are thrilled to have The Prince of Wales launch this special week on This Morning that will highlight the importance of continuing such volunteer work that is still very much needed throughout the UK." Youth United is a network of the UK’s largest and most established voluntary and volunteering youth organisations. It was established by HRH The Prince of Wales and is supported by The Prince of Wales’s Charitable Foundation. Members include the Army Cadets, Air Cadets, Fire Cadets, St John Ambulance, Voluntary Police Cadets, Sea Cadets, Scouts, Girl Guiding UK, Girls’ Brigade and Boys’ Brigade.